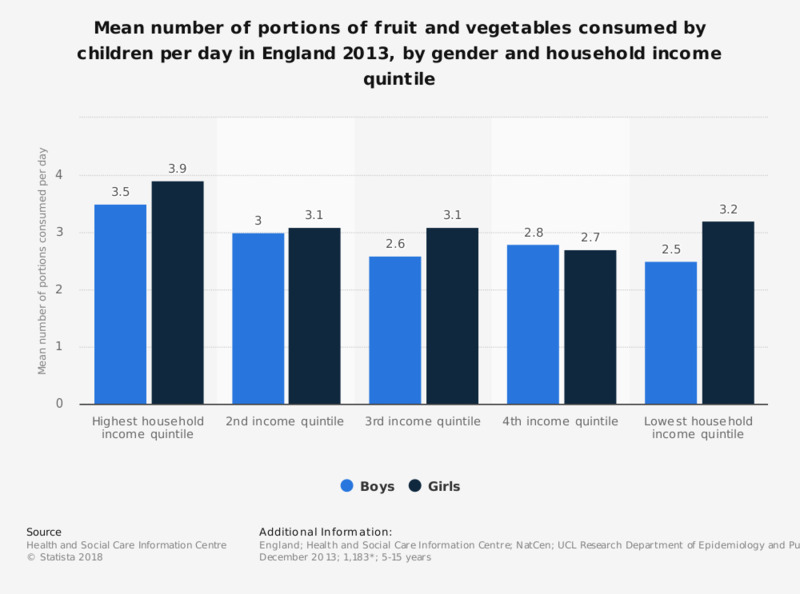 This statistic displays the number of portions of fruit and vegetables consumed by children daily in England in 2013, by gender and household income. In this year, boys in the highest household income quintile consumed 3.5 portions of fruit and vegetables daily and girls in the highest household income quintile consumed 3.9 portions of fruit and vegetables daily. Statistics on "Health and wellness food trends in the United Kingdom"
Autism spectrum disorder in the U.S. Attention deficit hyperactivity disorder (ADHD) in the U.S.
How many pieces of fruit and vegetables do you eat a day? How often do you purchase lower or no sugar variants of soft sparkling drinks? When you're eating healthily, what is your main motivation? Which do you think is the recommended daily allowance of sugar per day according to Government guidelines?